Hopefully, most of the Bif readers have already read about the Biggest Week In American Birding from some of my fellow BiF bloggers. The Biggest Week is organized and hosted by Black Swamp Bird Observatory (BSBO) where I am fortunate enough to be the executive director. (Thus, my absence from BiF for the last few months!) It's truly a wonderful event, and it generates a a great deal of support for habitat conservation in the region. As you might imagine, a 10-day birding festival is a monumental task, but the event isn't all that BSBO does. We also offer outstanding education programs, including our Ohio Young Birders Club for ages 12 - 18, and our free programs for schools, where K-12 students visit the Observatory to participate in songbird banding studies and learn about migration and the importance of protecting stopover habitat. 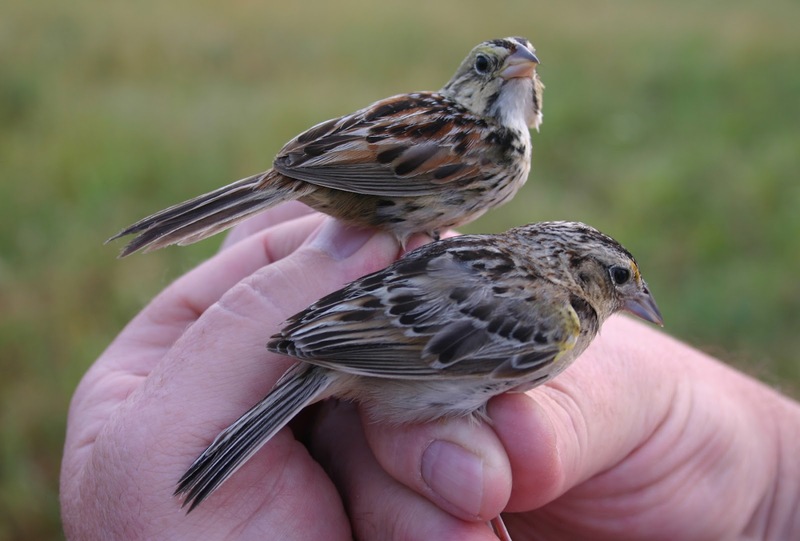 Another aspect of BSBO's mission involves the study of migratory birds, and this research served as the basis for the Observatory when it was founded in 1992. Our primary songbird research station is one of the largest in the country in terms of numbers of birds per net hour, an indication of the incredible volume of birds that pass through this region of NW Ohio, and the habitat that makes this region a globally important bird area. Our banding studies allow us the opportunity to study birds in a remarkable way, and we do our best to make the time we have the birds in our hands as meaningful as possible. In addition to all of the incredibly useful data we collect, we also try to take photos. By photographing birds in a variety of ways, we can produce materials that help unravel the mysteries and challenges of bird identification, and reveal some of the truly extraordinary features of these feathered gems. We share many photos on the BSBO's Facebook page, and some of the images that people enjoy the most are those that show similar and/or multiple species together. I thought it might be fun to share some of them here, but I hope you'll [Like] BSBO on Facebook, too! I'll leave the photos unlabeled at first, allowing you to guess the species. But don't worry, I'll reveal the answers at the end! One of my favorite things is when the kids at our school programs call these guys "Oreos!" I always tell them that they do NOT like to be dunked in milk, and their center doesn't taste nearly as good! Is this a cool photo, or what?!?! Five brown thrushes - all in a row. Can you name them, left to right?! Lots of colors in the names of these birds, as well as one fine city! Here's a hint, they both sound a bit like insects! how often they are correctly identified in the field. Okay, are you ready for the big reveal?! It's all about the yellow in the throat in spring! A close-up of the undertail coverts that help separate the two species. 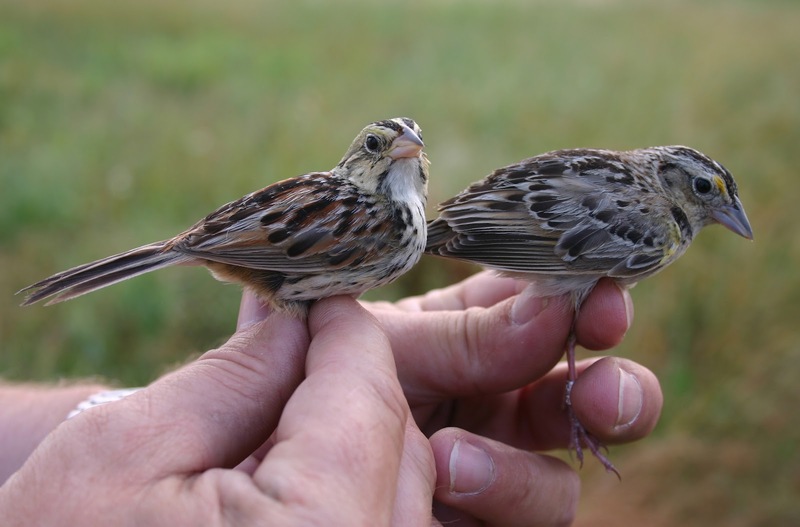 These two elusive grassland sparrows are seldom seen this well. Grassland habitat is in serious decline, and along with it, the grassland birds that depend on it for their survival. Banding studies help us identify the specific needs of these birds, allowing us to help land owners better manage the precious areas we still have left. The difference in bill shape is very evident when the birds are this close and this still. Both birds are in juvenile plumage. They really are adorable little birds, aren't they?! 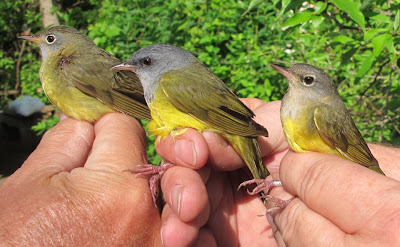 Female Connecticut Warbler, Young Male Mourning Warbler, Female Mourning Warbler! Having the birds together, and this close, you can really see that the eye ring of the Connecticut is much more solid and bold. The split eye ring of the female Mourning just doesn't "pop" like the Connecticut's. But in the field, it can be a real challenge to separate these two wonderful birds. This photo was Liked 365 times and shared more than 230 times on the BSBO Facebook page, and when Birds & Blooms Magazine shared it on their page, it was Liked more than 760 times! I hope you enjoyed these comparison shots. We feel honored each day that we are fortunate enough to spend time in the field with these amazing creatures, and I know you feel the same way. Many thanks to the research team at BSBO for the incredible work that they do for birds. This work would not be possible without the support of dozens of amazing volunteers that help our research staff conduct these studies. Thanks for reading, and remember, BIRDS RULE! Awesome post Kimberly! I'm saddened to say, but I did not get all of the IDs correct. I need to spend more time in the field! Those Vireo and Warbler comparisons are especially telling and afford such a great reference between the species. I'll be cross-checking any pertinent photos with this post for some time! Very cool post Kimberly! I've had similar experiences visiting the Idaho Bird Observatory. I think bird observatories like yours are wonderful ambassadors for birds to humankind. Great work! Thanks, Robert! It's great to be back on BiF. Kenn and I have visited with the staff at Idaho Bird Observatory and they do great work. Bird observatories are great resources for learning about birds! The Oreo thing really cracks me up! I'm glad I am not the only one that hears that from people all the time. They never like it when I tell them that Wild Birds Unlimited is not the place to find Oreos but they would be better off at the grocery store! Thanks, Kimberly - *and* BirdingIsFun! This is not just a great test but also a good training post. It does spoil us, giving us so much time to study and compare these usually flittery little birds.... Thanks! Thanks, Ellen! It does kind of spoil us, doesn't it? But it also shows why birding is so engaging. It isn't easy, it takes a lot of time, patience, and skill to be able to ID lots of different birds, especially those that are so similar! This is brilliant!! Very educational seeing these groups together like thi, especially female Mourning Warbler! Thanks, Lee! I'm so glad you enjoyed the photos! That was really educational, Kimberly. And by the way---you really have one proud Mama down here at Autumnwood. Just thought I would tell you that. Thanks, Mary Lee! I don't know if you saw my comment (below) but my mom could never be as proud of me as I am to be her daughter. She's my favorite person in the whole wide world! Please give her a hug from me! Thanks for reading my post and taking time to comment! Anyway, in case you didn't see it: Linda: You were a huge part of making the Biggest Week such a success - and helping to make it as fun as is legal in NW Ohio! I sincerely hope that you'll come back and be a part of our team next year! I'm already making plans to return next year! Sweet post! I got everything right but the flycatcher...and so my love/hate relationship with them continues. Thanks so much, Steve! I know just what you mean about flycatchers! I've probably banded more than 1000 of them - and they aren't much easier even when you have them in your hand! Mary Lee Creager: My mom could never be as proud of me as I am to be her daughter. She's my favorite person in the whole wide world! Please give her a hug from me! Linda: You were a huge part of making the Biggest Week such a success - and helping to make it as fun as is legal in NW Ohio! I sincerely hope that you'll come back and be a part of our team next year! Hey Rob! I thought for sure my Oreo caption would spur a comment from our friend Chad! :-) Thanks for sharing my blog post on Facebook and for your kind words about it. I'm very blessed to have a wealth of amazing photos at BSBO that I can use to help spread the word that BIRDS RULE! Thanks for all that you've done to support BSBO, the Ohio Young Birders Club, and the Biggest Week! You're the best! Thanks for the education Kim! Those photos are awesome. Outstanding! These comparison photographs really do assist in the identification process. Each and every bird is gorgeous! Thanks so much, Julie! I'm totally loving your latest post! Thanks for sharing these photos and pointing out the identifying differences. Love your site! Thanks for reading my post! Glad you enjoyed it! Thanks, Jeremy and Julie! It's great to be back on BiF after a very long (but totally awesome) month of May! Baltimore Oreos! A classic is 'ere enshrined. Looking forward to meeting you next month, Kim! Thanks, Heidi! Can't wait to meet you! This is an amazing post and very, very helpful as well! Congrats on all the "likes" and thanks for all the good work you do. I hope someday I can visit this place. Thanks so much, Kathy! I'm so happy you found it helpful. The number one reason we band birds is to increase our knowledge and understanding of their needs to help them. 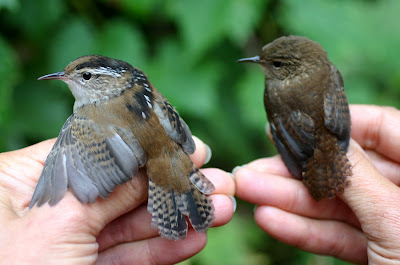 But banding can also be very helpful to birders, too! Thanks for reading my post and taking the time to leave such a nice comment!